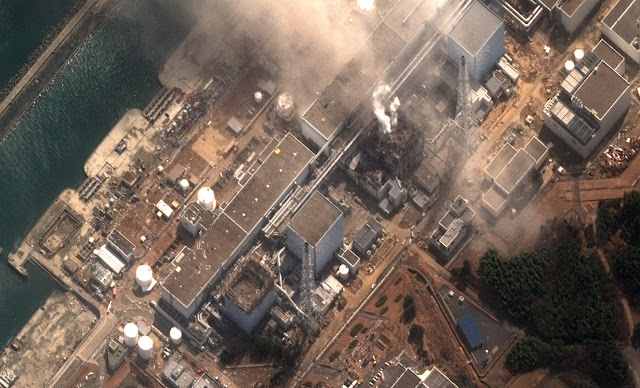 Fukushima 1 is completely out of control. A picture from Digital Globe shows the horrible destructions on the reactor buildings. You can see on the bottom of the photo the first reactor building which exploded on March 13. The ruin of the reactor building 3, in the upper half of the picture, exploded today. You can still see the smoke. In the middle of them sits reactor building 2. This reactor is now without cooling water. No water can be pumped into, because there are no devices left to do so. All 3 reactors are melting, according to nuclear experts. The government of Japan and Tepco, the owner of the plants, are still trying to play things down, but had to admit that there are a "kind of reactor melting" are going on. It's believed that there is no control at all, and all the people can do is wait and see if the three reactor hulls are holding. If they also melt, or explode, it would have unforeseen consequences. If you compare the upper photo, with former satellite pictures on Google Maps, it's clear what massive forces are at work. Debris on the neighbor buildings, and a lot of buildings at the seaside are completely gone. You can see the remaining ruins from some of them. Update: Full view of the explosion of reactor 3 [Video] Mind the size of debris falling down from the cloud.